Even after crouching, staring and “foot-feeling,” the best players in the world still misread greens. There’s proof every week on Tour. Pros do not always see the correct break, and like the rest of us live in a World of Optical Illusions (WOI). Misreads are caused by optical illusions, period. Even grain can be an optical illusion. Greenskeepers often set cups in known WOI spots, but now diabolical pin settings matter not. My green reading system, EGOS Putting — which stands for “Expert Greenreading Operating System” — visually rids you of all optical illusions. Why does EGOS work on every putt? This isn’t plumb bobbing, which has no math, no guarantees and no patent, nor is it immune to WOI. Plus, plumb bobbing is slow and frustrating. With EGOS, tour pros and amateurs alike will hole putts they used to misread. 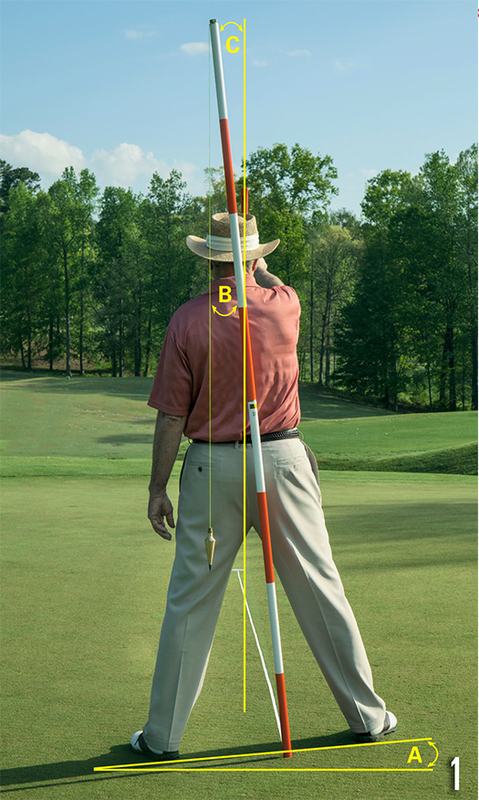 A = Slope of the ground, which I call “Angle/Gap” B = Angle/Gap between spine/rangepole and displaced plumbline/putter. EGOS starts by standing where the ball rolls as illustrated in “Putts To Win the U.S. Open” (we’ll get to that section). Each read is good for two to three steps in any direction. 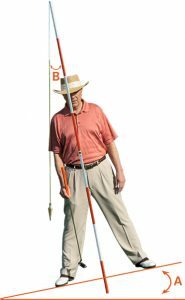 With a surveying instrument (SI) at your side, create the angle/gap to “B” by standing with your legs apart naturally, as I’m doing in Photo 3; do not tilt the torso or head on obvious slopes. Rotate your head to get your dominant eye on an extended spine, then close the other eye (see Photo 3 for an illustration of this using a tall surveying pole). 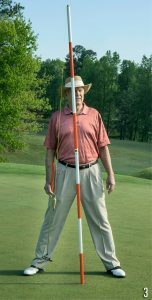 Quickly take your stance and execute EGOS putting the same way every time, all with our P&SI-EGOS putter, which is USGA conforming and includes support (see sidebar and my website for more information on the putter). Angle/Gaps separate EGOS from other green reading methods. It rids every putt of the WO. EGOS uses two ground objects, as illustrated in Photos 4 and 5. Object 1 is the cup for all reads except if you’re standing AT the cup; in that case, Object 1 is the ball. With SI at your side, visually run a straight line from Object 1 to your spine. Halfway, look for Object 2 on that line — an old ball mark, debris, discoloration, a blade of grass, anything on the line. With Object 2 identified, raise SI at arm’s length by lightly holding the lower grip with two fingers and put the shaft end directly on it. Look up the shaft to find Object 1, either the cup or the ball. If necessary, get your fingers near the cup by slightly adjusting Object 2 up or down the visual ground line, locking in the Angle/Gap “C.” Calibration will dial in the exact break for each C number. Don’t stare! In seconds, take a mental snap-shot of the Angle/Gap that practice green Calibration instantly converts to exact line and stroke force to roll the ball. If needed, walk to the next read and repeat. EGOS is precise green reading even on miniscule breaking putts where “foot-feeling” lacks precision. Taking stance, head rotation, SI lift to Object 2, snap the mental pic — it all becomes as automatic as blinking. Imagine standing over the ball knowing the exact line and stroke for the speed you prefer to hole putts. Ram it in with authority, or die it over the cup edge, or in between; it’s your preference. EGOS elevates confidence like never before. Pros drop those extra strokes for wins. For absolute precision on every putt, I recommend the SI putter. 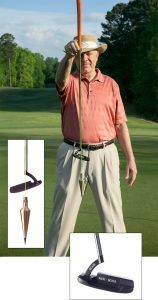 EGOS will get decent green reads with other putters, so for amateurs making putts that others misread and miss, plus speeding up play, engage EGOS with any putter. While any misread is discouraging, keep in mind that 100 percent perfect green reading through our support is a P&SI-EGOS putter away. Remember, the Angle/Gap is caused by gravity, so EGOS putting always works. If there is ever a bad read, it’s caused by pilot error. 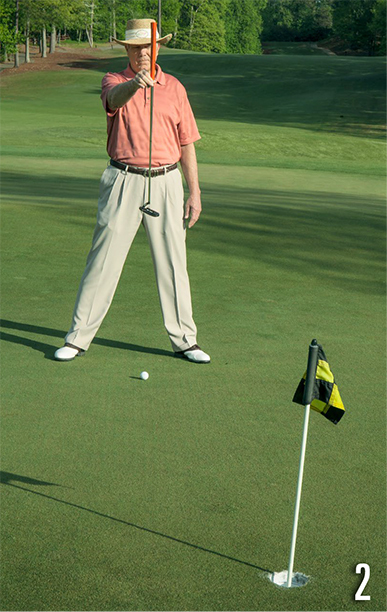 On a practice green, place your ball two steps (six feet) from the cup after deciding whether you want to practice a level, uphill or downhill putt. 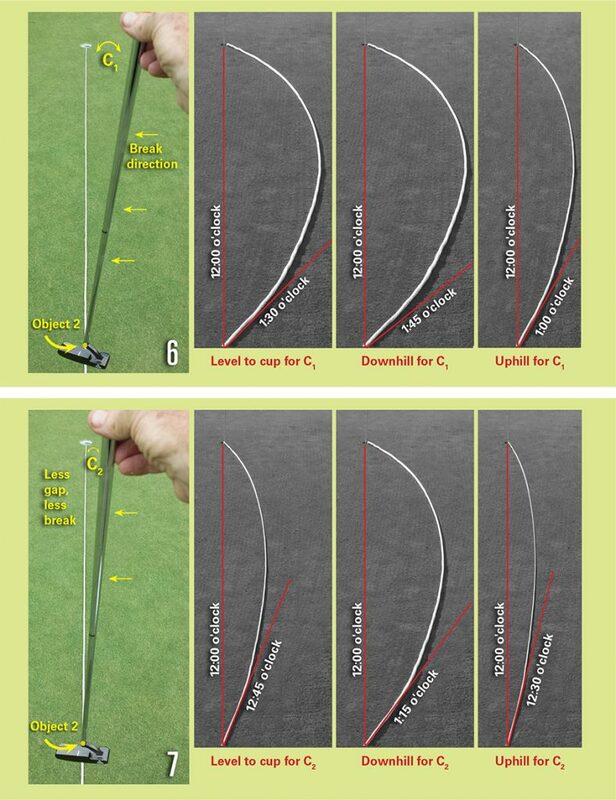 Take a mental pic read to establish an Angle/Gap, then make the putt at your preferred speed, locking in “o’clock line” and stroke force for that Angle/Gap and conditions of the day. Repeat with the other two slopes. Do the same routine with another Angle/Gap, memorize and take to the first tee. Done! It takes only minutes. Calibration becomes a “proportional feel” of o’clock and stroke force. 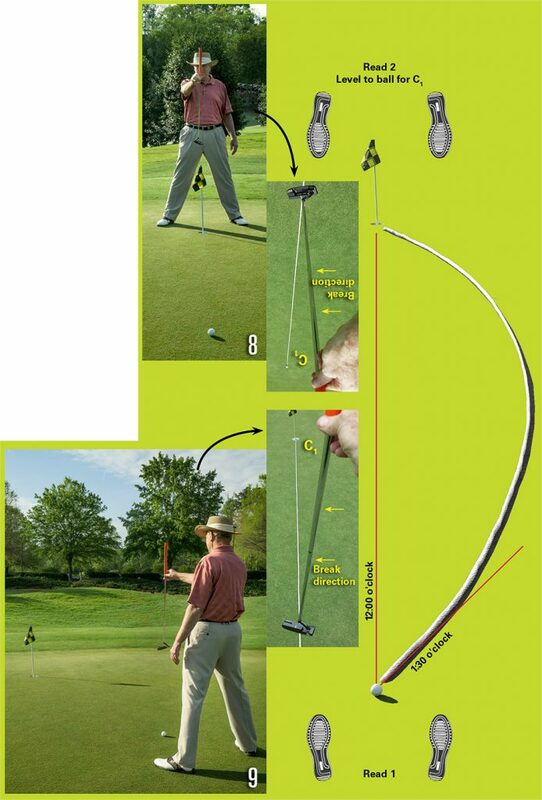 In the example illustrated in Photo 6, your first putt is level at eight steps (24 feet) from the cup with several C1 level reads, which instantly sets the putt line at 1:30 o’clock and stroke force at four times the six-footer on the practice green. No excuses! 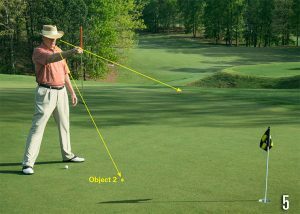 On a practice green for any C2 putt (Photo 7), make the putt at the preferred speed locking in the o’clock and stroke force. Memorize it and take it to the C1 putt. Retrieve ball from hole and celebrate! P&SI-EGOS owners get free tech support at www.expertgreenreading.com. As with any operating system, EGOS support corrects bad habits, which is vital for 100 percent perfect green reads that results in confidence over every putt. Based in Duluth, Georgia, Andy Walters is a professional engineer and surveyor, and an avid golfer and teacher.